My Amazing Grass Chocolate Green Superfood Review. Recently I got to sample some products from a company called Amazing Grass. I have to admit, the company name made me chuckle (sometimes I can be immature) but the products really piqued by interest when I heard Kelly Slater drinks them (I’m a surf dork). So it’s got to be chalk full of good stuff, right? Then I remembered I’ve totally seen these products in the supplement section at Whole Foods. You know the Wheat Grass powder drink they have available for sample in the drink machine? That’s them! 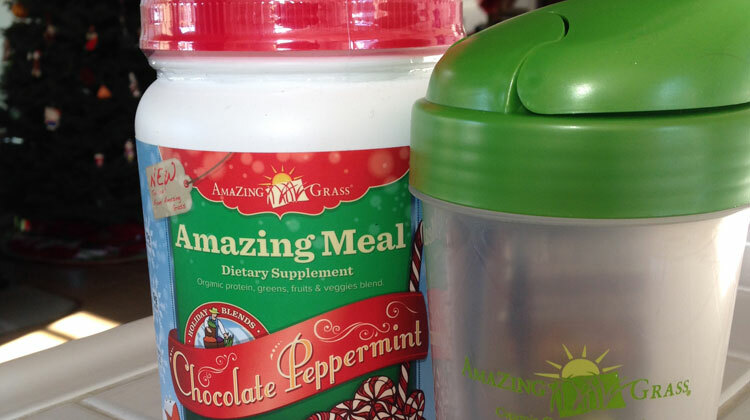 Amazing Greens sent me two of their Amazing Meal holiday flavors: Pumpkin Spice and Chocolate Peppermint. The Amazing Meal Chocolate Peppermint flavor was so darn good. It tastes like a cold version of peppermint hot chocolate. I didn’t even use a blender – I drank it in the nifty shaker blender Amazing Greens provided me and mixed it with almond milk and nothing else. And? It was pretty darn good. It was easy to mix just using a blender bottle and didn’t clump up or taste chalky like a lot of other protein powders do when they aren’t thoroughly blended. I drank this for breakfast a lot over the holidays and I felt like I was eating candy for breakfast but instead I was getting all sorts of good nutrients like chlorophyll, protein, a greens blend, and probiotics. Score. Want to know what’s in Kelly Slater’s fridge? Here you go! The other flavor I got was their signature Amazing Grass Green Superfoods Chocolate Drink powder. This one came in little packets I could take on the go and mix in my drinks as a snack or with a meal. It’s also the one Kelly Slater keeps in his fridge. I drank these daily when I was battling my cold / sinus infection / flu bug that knocked me out for several weeks of December. I liked the chocolate flavor and that I could get my greens in liquid form since I honestly couldn’t stomach much food when I was sick. I am still mixing the packets with water or throwing them in my morning smoothies for some added nutrients. The green superfood powder more organic greens per gram than other green powders which is pretty cool. It’s also made up with mostly raw ingredients and is gluten free. I loved the Chocolate Supergreens drink powder so much that I even gave a couple of my samples to my fellow Sweat Pink ambassador Secret Santa buddy – Jacquie from Run with Chocolate. On her blog she had mentioned how much she likes chocolate so I figured this would be something we might really enjoy. Sadly, the Pumpkin Spice and Chocolate Peppermint Amazing Meals are only Holiday flavors. I’m almost out of mine and I am going to be sad when its gone. I tried looking for them online but I haven’t been able to find these flavors online. They do sell this product at Whole Foods so maybe you might luck out and find it in your local store. But Amazing Meal does come in other standard flavors like Pomegranate Mango Infusion, Vanilla Chai, Cafe Mocha, and Chocolate Infusion (different from the Chocolate Superfoods powder), or the Original Blend. There are plenty of other flavors you can check out. You can learn more about all their products by visiting the Amazing Grass website as well. So would I buy Amazing Greens and their Amazing Meal products in the future? Definitely. I always pass by them in Whole Foods and now that I know how tasty they are even without being blended, I will definitely be coming back for more! Hope you enjoyed my Amazing Grass Chocolate Green Superfood Review! What about you? Have you ever used Amazing Meal or Amazing Greens? 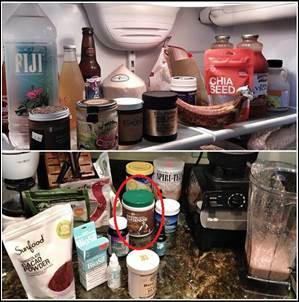 What type of dietary supplements do you use? Post in the comments and let me know! **Disclosure: I did receive product samples of Amazing Meal and Amazing Grass to try out for consideration. I liked it so much I decided to review the products. The links in this post are affiliate links which means if you like this review and make a purchase it helps to support this site. All thoughts and opinions, as always, are my own. I really wish I would’ve tried the holiday flavors! I’ve used Amazing Greens and enjoyed the drinks. Their bars are also really delicious.